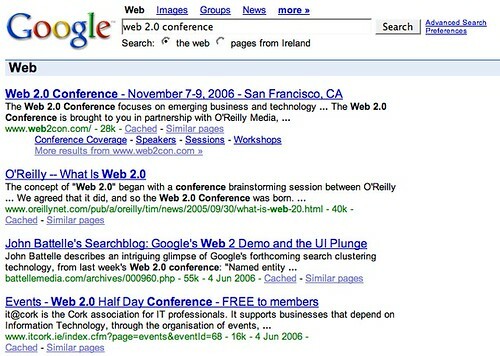 Thanks to all the publicity generated by O’Reilly/CMP’s Cease & Desist letter, a Google search for “Web 2.0 Conference” now shows the IT@Cork Web 2.0 half-day Conference as the 4th placed result! Thanks guys! If you are interested in going, register to go on the IT@Cork website on the conference page. It promises to be a fascinating series of talks. 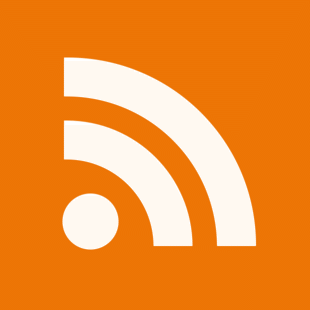 hi all, just listening to TWIT number 56 and there is a small bit on the Web2.0 Conference controversy mix-up, 11 minutes from the end of the podcast. Wow, Tom, you more or less got “knighted” in Germany! Our leading bi-weekly IT magazine “c’t” published a little (1/8 page) article on the “Web 2.0” controversy. Email me your fax number and I’ll send you a copy on Monday. Apologies if you’ve heard about this but I didn’t see a response from you so and haven’t read enough of your blog to know so thought I’d mention it. It came up pretty quickly when googling your name! Hey Donal, I saw that post alright, no worries. Thanks for the heads up!